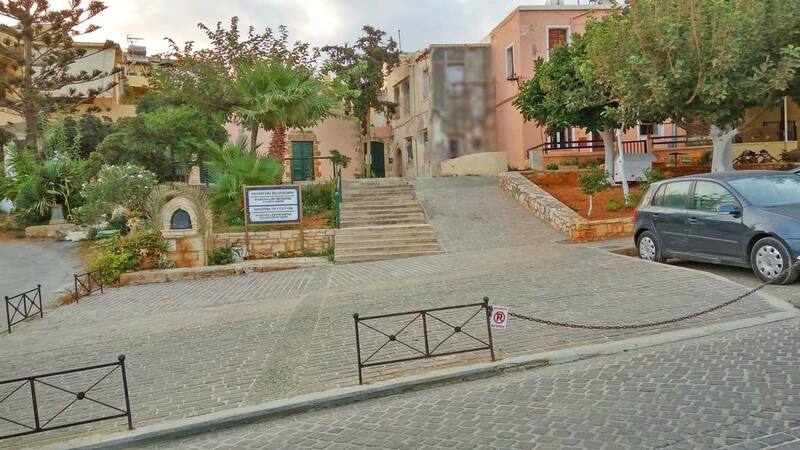 With respect to the Treaty on the Functioning of the European Union, the Hellenic Ministry of Environment and Energy and our personal beliefs, San Salvatore Monastery has implemented an environmental policy based on the principles of protection, prevention and restitution of the environment. Offering quality services is of prime importance to us, along with providing a safe environment that would also be relaxing, rehabilitating and healthy. That being said, it is our firm belief that having a long term environmental action plan and policy which complies with the Green Key guidelines will help us monitor the quality of services provided, our contribution on fair environmental management and will help us create bonds with individuals and organizations sharing the same principles. 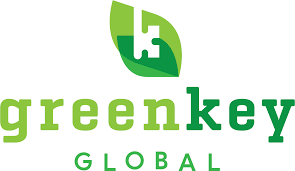 Learn more about Green Key guidelines . Which facility/amenity do you consider most important for your rental apartment? Which one would you use most? Based on the feedback we've got so far, guests would like more facilities to be available. We all take pride from good reviews. 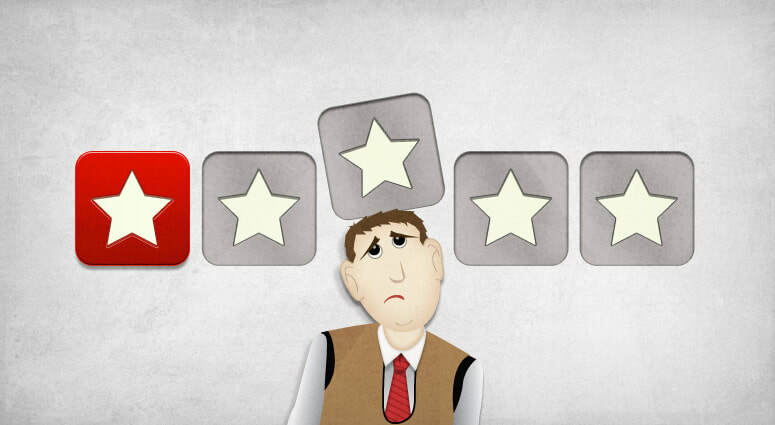 However, it's only fair to share negative feedback too in the hope that future guests will get a better understanding of the services we offer and it will avoid frustration. Here is a summary of the latest complaints. 1. San Salvatore is not easy to find. There are no signs. 2. Private parking is too expensive. I need to have easy access to my car and you are located in a busy area. 3. I didn't know additional services carry a surcharge. 4. I want to check in whenever I want without having to let you know. There must be someone in the reception 24hours a day. 5. I want to be able to check out whenever I want and leave without any notice. If there are any damages, I'm not paying for them. It is not unusual for people to appear at our front door, tired and frustrated, saying “Why are there no signs?” Indeed, there no signs, other than the welcoming sign on the door telling you you've made it. Welcome to your adventure. So, why are there no signs? There are a few reasons for this. 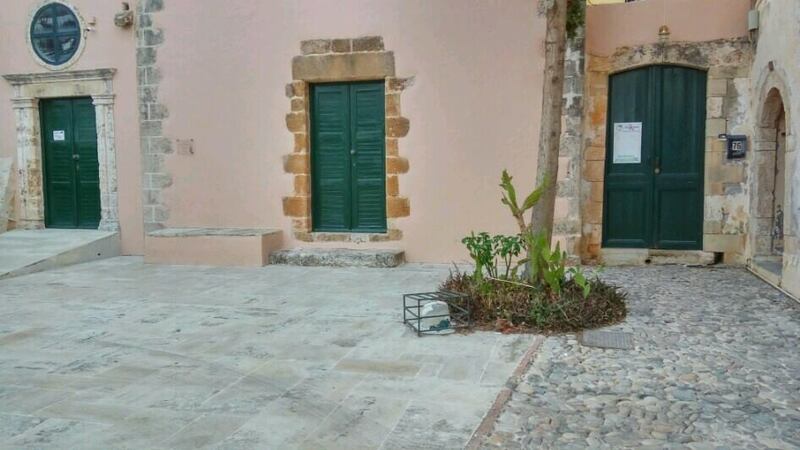 Firstly, Chania is a small, very beautiful town of which we are very proud. If you notice the most common landmarks, museums and archaeological sites, signs are kept to a minimum. The same guidelines apply to the entire town. While you may have noticed, or will undoubtedly notice on your first trip into the old city, there too many signs almost everywhere. The authorities are more strict when it comes to specific protected buildings such as the San Salvatore Monastery. Apart from the regulations and restrictions, we don't believe in contributing to this communication-pollution of our beautiful city, and prefer to use many of the old, historic buildings and sites as our signs. This is why we give you directions using these buildings and sites as reference points. Secondly, we like to believe that our guests are intelligent, adventurous people who can find unique, amazing historic buildings and sites with the use of our instructions and maybe a map or a gps. 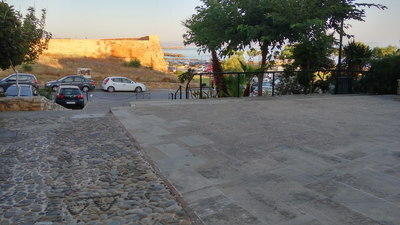 We also believe that using these ancient and unique buildings and sites as our landmarks, we help you discover the true beauty of our wonderful city, which is of course part of the reason why you are here. Don't look for signs; look for the arrival information in your email or check our website! 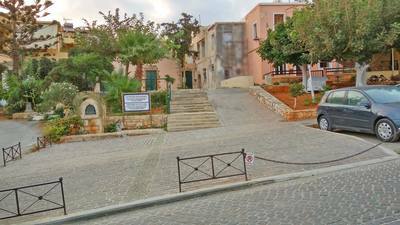 San Salvatore is located in the old town of Chania, in the district Topanas. 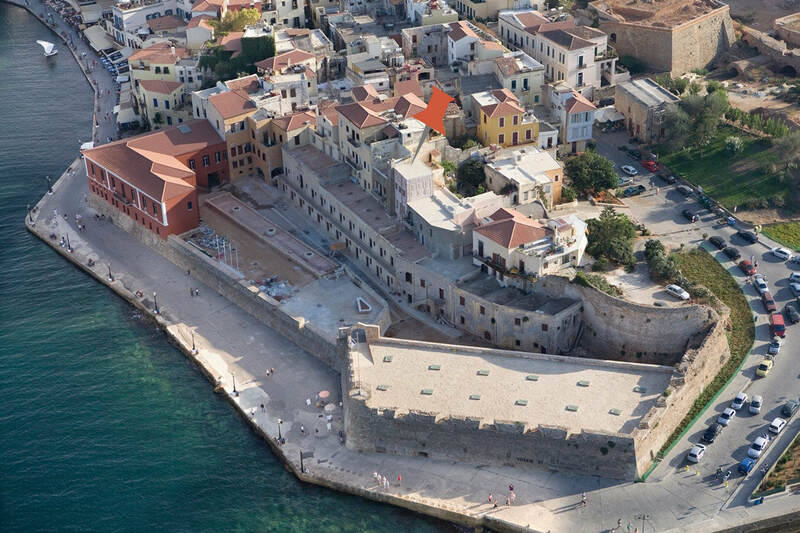 Like many other medieval towns such as Venice, Lyon, Rhodes, Athens, Rome, Vienna and Seville to name but a few, the old town of Chania is a pedestrianised, car free zone. 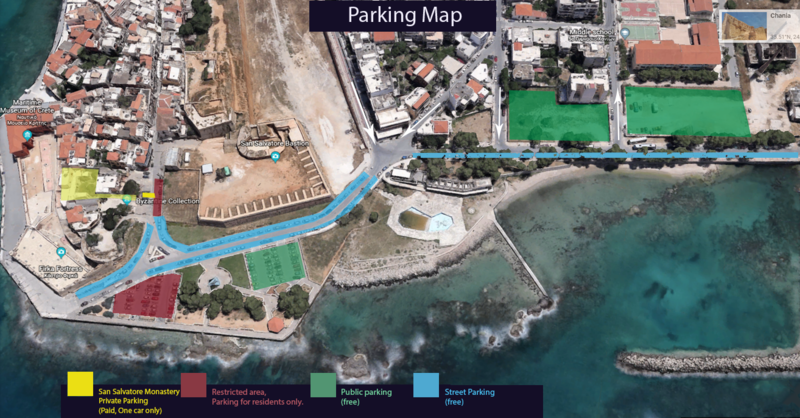 Unlike all other accommodation providers and hotels, we are privileged not only to have a private, protected parking space for your car but also to be located right next to the old city gate, which is where the pedestrian area begins. On top of this, there are the free public parking areas on Talo square, around “The hand” monument and the old “Avea” factory, both of which are within a 300 meters of the San Salvatore Monastery. If we didn’t charge a surcharge for the only private parking space in the area, it would not remain private much longer and would not be available to anybody, ever.. Upon arrival and when departing you are of course free to use the private parking space right in front of San Salvatore Monastery to drop off or pick up accompanying guests and your luggage. 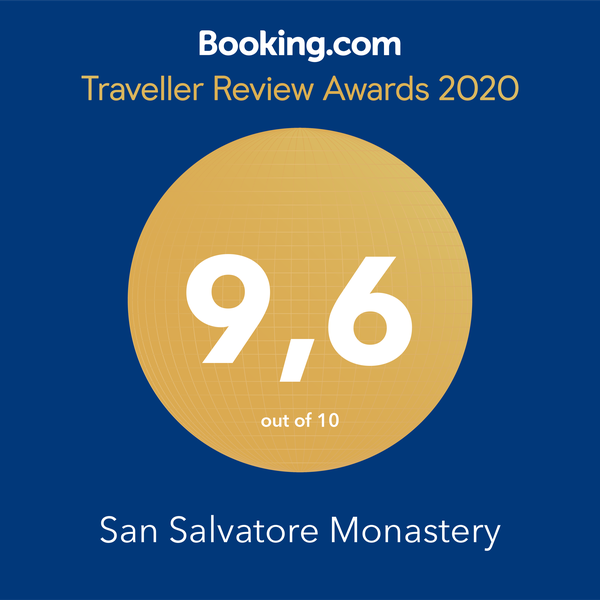 We help you bring your luggage in and then show you where to park your car, free of charge, within walking distance of San Salvatore Monastery.
. I didn't know additional services are for a surcharge. Guests can reserve an apartment using different means. They can book by phone, drop by and make an instant reservation or, most commonly, book on-line. Regardless of the booking source, i.e. a partner such as booking.com, or a direct booking through our website, guests always receive a confirmation email with reservation details. In this email guests can clearly see which services and facilities are included in their reservation. It goes without saying that if a facility is not listed in the details then it is either not available or not included in the room charges. Although it is rare that such problems occur, surcharges might apply in a few circumstances. First, new facilities in case of an upgraded apartment; or a new service may or may not attract a surcharge. To avoid any misunderstandings, every time there is an upgrade we inform guests with confirmed reservations and let them know if there are any changes that will affect their stay. We never change an agreed price and it is not uncommon for guests get more than they paid for. Second, so far we have kept prices as low as possible which leaves some space for services that are not deemed necessary, to be offered for a surcharge. Private parking, laundry service, airport shuttle etc are not considered essential and guest are free to make their own arrangements or ask for our help. Last but not least, when it comes to regulations on short term rental houses, the laws in Greece are very strict and specific. You only pay for the apartment and we are allowed to offer you linen but nothing more than that. No services can be part of the rental agreement. Everything we offer is part of the Greek hospitality which is based on mutual assistance and understanding. You have found exquisite accommodation in the heart of the old city of Chania which will go a long way to help you have the best holiday possible. It takes minimum effort on your behalf to be kind with your host and appreciative, and if there are any additional charges, rest assured, it's for a good reason. 4. I want to check in whenever I want, without having to let you know. There must be someone in the reception 24hours a day. 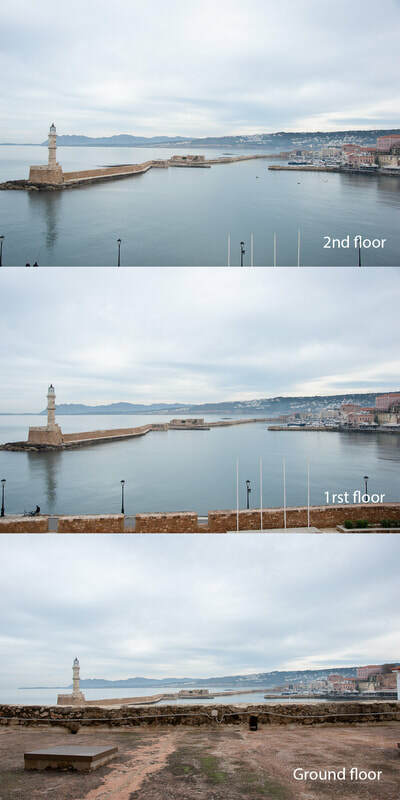 “-Expectations: Our guests can expect privacy, serenity, magnificent views and luxury in the heart of the old town and within walking distance of every place of interest in the Chania town. However services such as reception, daily cleaning, meals, credit card processing etc are not allowed under the laws of Greece. -24hour check in: As there is no reception, all guests need to confirm the time of arrival with us. Free 24hour check in applies only if it is pre-arranged, otherwise a 10% surcharge applies”. In order for accommodation services to be able to function properly, check-in and check-out periods have been set. The whole society is based on working hours and quiet hours, so this should be no news to you. After all, you wouldn't expect an airplane to wait for you to arrive at an unspecified time in order to take off. So why expect your host to be waiting for you all day without previous notice? and we also have the appropriate check-in and check-out periods which are binding to the rental agreement. Before you pack your suitcases for holidays, look for the check in time in our arrival instructions or reservation details to avoid frustration. Ideally, confirm your time of arrival with us when making the reservation and if you need to request a late check-in don't hesitate to contact us. 5. I want to be able to check out whenever I want and leave without any notice. If there are any damages, it's your fault because (… you name it) and I am not paying for the replacement or repair. Our guests receive the following information before check out date. *In case of a late check out available: Late checkout (...:...) is available for tomorrow. Kindly let me know of your expected departure time. Although it's common courtesy to say goodbye to the people that have accommodated you, strictly speaking it is not necessary. After several guests left the apartment without any notice, leaving unsettled bills and most importantly leaving damage, all new guests need to arrange a security deposit in order to be allowed to check in. Security deposits are fully refundable within 5 days after check out providing the apartment is left damage free. Security deposits are arranged on-line so that they can be refunded easily. Needless to say that you are expected to leave your apartment as nice and tidy as you found it. We do understand that accidents can happen, and a broken glass is nothing to worry about. There is however a big difference between a broken glass and a broken window… We take our time to show you your apartment in detail upon arrival. And we check each apartment after our guests leave,. If you have any questions, queries or doubts, the time to raise them is during your introduction tour of the apartment. This statement is a formal, public reply to the private feedback we received from the guest when confronted with the damages she and family left us. Booking.com reservation number is 1644053780. The guest also left the public, anonymous review quoted below. Κυρία ειρήνη έβαλα τις βαλίτσες εκεί όπως μου είπατε να τις βάλω φταίτε εσείς που μου είπατε να βάλω τις βαλίτσες εκεί Αντώνη Πετρωτό όταν ε δεν θα της έβαζα και εγώ. Δεν είχα ζητήσει leit check out όπως μου λέτε γιατί είχα κανονίσει ραντεβού το πρωί να φύγω από το ξενοδοχείο σας την αλήθεια είναι χειρότερες δύο μέρες που έχω περάσει στην Ελλάδα ήθελα μαζί με σας. Τέτοια κόλπα δεν έχω. Ποτέ στη ζωή μου συνάντηση 20 € για ταράτσα 50 να παρκάρω και να 'ρθω από τις δύο στις τέσσερες και τα σχετικά. Τα παιδιά μου δεν πειράξανε τίποτα εκεί που λέτε στο πάσο οι γρατζουνιές ίσως να ήταν από τις βαλίτσες που μου είπατε εσείς η ίδια να τις καταθέσω. Να είσαστε σίγουροι στο booking dot com και στο τραπέζι βάζουν θα τους πω τι χάλια ξενοδοχείο είναι Και να σαι σίγουρη σε σας δεν θα ξαναγυρίσω. Θα σας πάρω τηλέφωνο να σας πω την αλήθεια δεν έχω τίποτα να σας πω για την ζημιά αυτή ήταν από τις βαλίτσες και δεν ήτανε γι μένα επίτηδες εσείς μου είπατε να βάλω τις βαλίτσες εκεί και έτσι έκανα όπως μου είπατε. Σε εύχομαι Για την συμπεριφορά σας .